Running out of blog ideas? Writer's block can happen to anybody, so don't worry. 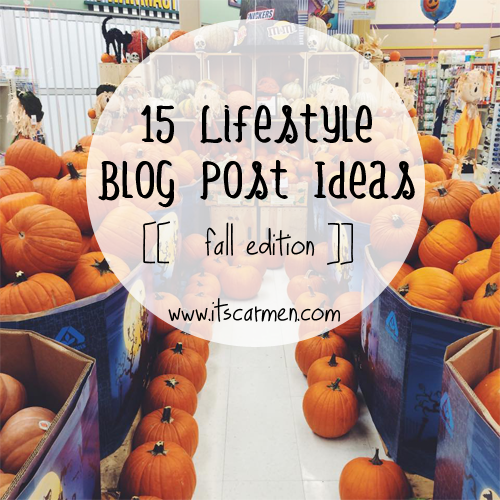 I've got 15 lifestyle blog post ideas for fall to get you going for the rest of the season. Keep up with seasonal topics & create fresh content for your readers. The thing to remember is that consistency is key when it comes to blogging & growing your readership. Updating your blog once every 2 weeks doesn't make for good statistics. Your readers won't know to keep coming back. 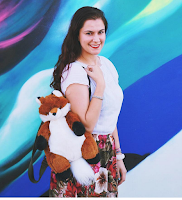 Stay inspired with these lifestyle blog post ideas! Fall is a wonderful time of year when the nights start to get cooler. The morning breeze starts to chill. The sun no longer works like it did in the summertime. You might find yourself in a nice, thick coat or some comfy boots. Use this time of year to your advantage. Write about it. Write about those pumpkin spice lattes or your favorite seasonal dish. Write about those fantastic crafts you've seen online. Write about how you love this time of year, hate this time of year, or are indifferent to this time of year. Just write! What a great list, I love all of the suggestions! I would love a perfect autumn day guide - movie/walk in the park/candle lit/fire burning and so on! Awesome list, girl :) Always good to have different ideas. I def wanna do one about FOOD! Great list! It's always nice to get new ideas for blog posts. Thanks for sharing! Some great ideas. I will definitely be keeping the list around in case writer's block strikes me.. Awesome suggestions! Personally, I especially love to read on point 12, "styles must have for autumn"! Nice suggestions! Thanks for sharing Carmen! This is a really good list. Definitely saving it for when my inspiration runs dry! This is such a great list! Writer's block is the worst so I could definitely use a few of these suggestions :) Thanks for sharing! What a perfect list - thanks for some new ideas! Great list! I will definitely use it when I have lack of inspiration! Great Ideas, I love this season so much! xo! Great idea!This is so helpful! I love this list! I also just stumbled upon your blog today and I'm completely enamored. Keep up the good work! Great list (and you have a lovely blog too)! I especially like the idea of favourite autumn songs and films. I'm thinking of doing a post soon on my favourite autumn tv and film! These are great post ideas! I like the autumn decor idea from Pinterest.., that's a great place for inspiration! Makes me excited for Fall even more! Loving this list! Great ideas and so inspiring! You know... this post might just make me try writing about something other than original crafts/diy/recipe content. It would take a lot less time and photographing (especially with how little daylight I'm getting to take pictures...arg!). Thanks for the ideas! Very insightful article. Thanks so much for sharing. Thanks for the ideas...I'm trying to be more regular about writing so I will keep this list handy.